Provolone is a semi hard cows milk cheese that is mild in taste. 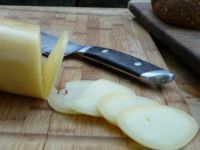 Our provolone is produced in a trasitional cylindrical shape. In South America the cheese is enjoyed before eating grilled meats melted directly on the grill.